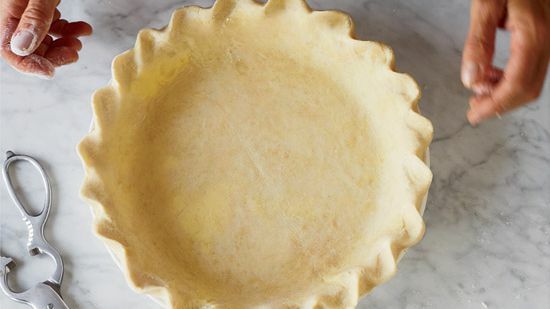 If you’ve ever made a pie from scratch, you know that there’s always some dough leftover. Don’t let it go to waste! Here, the F&W Test Kitchen offers some fun (and delicious) uses for those unavoidable scraps. 1. Bite-size quiches. Press the dough into mini muffin tins and fill with savory egg custard and little bits of bacon or leftover vegetables before baking. 2. Flaky cinnamon rolls. Gather the dough, roll it out into a 1/8-inch thick piece and sprinkle it with cinnamon sugar. Roll the dough into a log, slice and bake. 3. Mini empanadas. Gather the dough, roll it out 1/8 inch thick and cut out circles. Fill the centers with leftover chopped chicken and cheese, fold them in half, crimp the edges together and bake for mini empanadas. 4. Nutty cookies. Press chopped nuts into the scraps and bake for easy (albeit irregular) cookies. 5. Wee pains aux chocolats. Gather the dough, roll it out 1/8 inch thick and cut it into triangles. Sprinkle them with chopped dark chocolate and roll them into mini croissants. 6. Sundae toppings. Dust the dough scraps with ground green cardamom and bake them as-is. Crumble the crispy crust pieces for a fun yogurt or ice cream topping. 7. Homemade cheese crackers. Gather the dough, roll it out 1/8 inch thick and cut it into squares. Sprinkle it with grated Parmigiano-Reggiano and bake for quick crackers. 8. Exotic pigs in blankets. Wrap the dough pieces around slices of chorizo for a riff on pigs in a blanket. 9. Breakfast pastries. Gather the dough, roll it out 1/8 inch thick and cut it into squares. Fill the centers with fruit compote or preserves, then fold them in half, crimp into triangles and bake into mini turnovers. 10. Delicate breadsticks. Gather the dough, roll it out 1/8 inch thick and cut it into long strips. Dust with sesame seeds and bake for breadsticks.